Drying fruits from your garden is a safe and convenient way of preserving your crop and dealing with gluts. 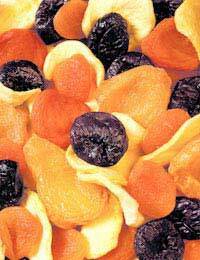 Dried fruits make a great snack on their own or they can be added to salads soups or casseroles. The flavour of the fruit is often intensified when it’s dried, such as tomatoes, or changed completely, such as raisins, so they can form a very important part of cooking in their own right. There are two main ways to dry your fruit: oven-drying and using a dehydrator. Oven-drying can be used to dry fruits such as tomatoes and apples. A very low oven temperature (130C/250F/Gas mark 1) or the bottom, oven of an Aga is perfect. Wash the fruit and slice it finely using a serrated-edged knife. Arrange the slices in a single layer on a large baking tray and leave in the oven for several hours or until they’re completely dry. Then leave them to cool and store in an airtight container. Consume within a few weeks. There are several fruit dehydrators available on the market, ranging from small, family-sized units to larger commercially-styled ones that can dry pasta and meat as well. Place your drier in a place with a good airflow. This stops the moist air that’s being extracted from the fruit from being re-used and therefore increasing humidity. Place food slices in single layers on each tray and do not overlap them as this will lead to uneven drying. If your dryer has a timer you can set it to the recommendations of the manufacturer. Rinse the fruit, removing stems, pips and any bruises, and then pat it dry with paper towels. Thinly slice the fruit with a sharp knife. Try to ensure your fruit pieces are all the same size as this will result in more even drying. Pears, apples, citrus fruit and stone fruit can be dried without having to be peeled. Different fruits take different times to dry. The thickness of the slices can also affect the drying times along with the humidity, moisture, altitude and content of the fruits. For the best quality produce, always choose firm, ripe fruits freshly picked from the garden. This ensures that the sugar and nutritional content of the fruit is high. Commercially-dried fruits are often treated with artificial chemicals such as sulphur to help them keep their colour. If you dry the fruit yourself you can be safe in the knowledge that no artificial preservatives or other chemicals have been used in the process. The fruit may lose some of its colour in the long term, but it’s still perfectly safe to eat (and is much better for you than chemically-treated fruit). It is not necessary to pre-treat fruit before drying, though you may find you want to if you intend to help the fruit keep its colour. It can also help prevent the loss of vitamins A and C, which diminish naturally in the drying process. You can use natural dips like lemon or pineapple juice. These reduce browning of your dried fruit, which mainly occurs in apples. Slice the fruit directly into the juice and leave it for five minutes. Then drain thoroughly before placing on the trays. Stone fruit such as plums and apricots can be treated by preparing a solution of one part honey to two parts of water. Heat the solution to dissolve the honey and allow it to cool completely. Add the sliced fruit and allow to soak overnight before starting the drying process. This will help to retain the colour and give it a light glaze. Once you have removed the stones from fruits such as apricots and plums, you can turn the fruit halves inside out, then place them skin down on the tray. This reduces the time it takes to dry them. Fruit such as grapes and blueberries have a natural waxy coating, which make them less able to dehydrate. It’s a good idea to plunge them in boiling water for two minutes prior to drying; this helps make them more porous and speeds up drying time. When it is properly dried, your fruit should be nearly crisp, and pliable or leathery but with no damp spots. Leave the fruit to cool and then check to see if it is fully dried by tearing a piece in half and squeezing it. If the fruit is still moist you will need to dry it for a longer period of time. Once cool, pack the fruit in sterilised jars or paper bags immediately and keep in a cool, dark place such as a cupboard. You can rehydrate you fruit for use in yoghurts, soups or casseroles by placing it in a cup of boiling water. Let it stand for half an hour and then use directly in your recipe. Drying fruit is a superb way to deal with gluts you may have in your garden, extend the season of eating fruit, or simply provide an alternative to eating raw fruit. They still count as your five-a-day, and make a great snack. Would like to know whether fruit like pears should be very ripe before drying or still quite hard? What have readers found best?